me to speak on Post Abortion Syndrome, however, I felt that after several other speakers speaking about the after-effects of abortion and its symptoms, I would spare you more post abortion trauma and perhaps offer a different look at post abortion grief. I never like to give satan an even chance and this conference being a conference on “Hope” I would not like him to have the last say on the matter because I believe that handled well post abortion grief has all the dimensions of “hope” inscribed within it. That the decision to abortion is swathed in total hopelessness is true. This I can tell you from my own personal experience, Yes I am an abortive woman and the moment of the decision is totally “ hope less” There is a sense of no tomorrow, but God in His infinite Mercy and Love always comes to rescue and where He is permitted he brings the graces and healing and change that ensures that love is never destroyed…. I hope you won’t mind my change of subject for this talk……..
and important type of mourning and grief. I speak about the parents who look deep into the future and see the absence and the pockets of loneliness created by the loss of the children they have aborted. I speak about the parents who realise that they have sacrificed their children on the altars of convenience, fear, money, and career. I speak about the modern understanding of “motherhood” which has been so wounded, and the women who no longer understand “mothering, motherhood” and the dignity inherent in this charism. I think also about “fatherhood” also deeply wounded through abortion because the man who took his child to be killed has failed to protect that child the one whom they have engendered. Today we know that when an abortion is suppressed from the consciousness, malignant and sometimes puzzling pathologies arise. We also understand that grief and mourning is that process of disengagement from the lost loved one and the emerging from this time in such a way as to be able to continue living without the one lost. When this mourning, this process of disengagement is not carried out well then indeed the puzzling pathologies should be expected, because the mourning which would have been the natural response to loss was suppressed. We of course can tend to forget the healing power of grieving and mourning. And that in the grief and mourning, when done well a growth, a change, a maturing of the spirit is possible whilst at the same time the imprinting of the event into permanent memory is facilitated. At times it can be felt that those who abort do not deserve consideration and compassion, that they themselves permitted the abortion, and perhaps it can be thought that all efforts at easing her grief, and easing her pain is a wasted effort. However, I know that this is far from reality. I know that in my work I help to bring back to the one who is mourning and grieving, a respect for their own human ness and a respect for the one they aborted. I help to unglue their emotions which are still stuck in the day of the abortion. This is good mourning work. It is important mourning work because each 1 person, including the abortive mother is human and frail and wounded but still designed in the image of God. Wounded ……..YES!!!! Unredeemable NO! and with this vision of the human in mind, it is possible to minister to the most wounded and broken in our society, that is, those mothers who have aborted their child (almost willing at all times) and have regretted that decision. and then relinquish the child, this time willingly and lovingly into the arms and household of God. This time without the terror of the first time. Without the confusion. Without the inner turmoil. This time in sadness, YES but lovingly also. You know to sit with them in the silence which is steeped in love, to weep with someone who is hurting over a mistake which they cannot undo, is to be present in a most intimate moment of a human’s life. To be present and to mourn with a mother who has aborted her child and to relive with her the dying of that child is to be with her, and be intimately and consummately near. extraordinary mercy and love that a human can weep for another, even the smallest in utero human. As a society we need to unmask this grief To bring it to the forefront, to make it visible and then to mourn for the loss of these children even when their own mothers and fathers cannot mourn for them. We need to weep even though there is the wrong belief that it was not a child who died but the so called “cells” “tissue” or whatever euphemism used. We need to mourn because in our mourning we do speak a language of love. In the mourning we say something very important. We say “YOU MATTERED TO ME”. need to mourn because very sadly this society refuses to mourn and weep for the loss of millions of its children and slowly our civilisation has suffered a dulling of conscience. This is a society which no longer sees children as a mark of blessing as described in the Psalms as a “quiver full” but as disposable, on demand, and this demand as a “right” and by sanction of the law. We need to mourn over the loss of the aborted babies because in the mourning we speak a language which belongs to the substance of the psychic life of the human person. Mourning is a sign and symbol of value, of love, of emotion, of eternity. that unveils the human yearning for eternity. and vital for the spiritual wellbeing of the person. In its external manifestation it speaks of the richness of our human inner life. And wherever there is no symbolic present there is a deep disequilibrium of the spirit. Abortion means no death rituals, no body, and no formal leave taking. No goodbyes. Abortion means death, but no recognised 2 ending. This is important to remember and to understand because the abortion industry thrives because of this. The abortion industry has thrived mainly because it set out to change the language first, and with this accomplished then it became easier to convince society that conception is nothing more than “a bunch of cells” and nothing to mourn or grieve for. THIS IS THE SAME LIE AS IN EDEN “YOU SHALL SURELY NOT DIE” So we mourn, we grieve for our loss (Yes there was a death) and in this mourning our hearts turn to God for His Mercy. This abortion grief has inscribed within it the blueprint for hope and for healing, for redemption. always meant a specific something. To all cultures the terms mother, father, baby have the same meaning. There is imagery which accompanies these words. The imagination is able to process the words and create an image, and be at peace with the images, whereas the new language is imageless “foetus” “Tissue” “cells” “specialised cells” does not have a visual attached to it, so it is easier to dispose of something which cannot be seen or even visualised. The imagination is a function of the human memory and struggles to make images of the term foetus, therefore it becomes easier to convince society and women that very little is terminated in the termination of a pregnancy and if there is little to be terminated then there is little if anything to mourn and weep about. This is where disequilibrium happens, becomes it cannot make sense of the absence of symbol and imagery yet experienced something very important. Imagination always finds its abode in the realm of images where it is at peace and at home. There is a need to mourn, to weep; we need to be able to express grief because it is the most profound of our emotions. It touches on the moral law written into the human heart (Jer 31:31:33 & Romans 11) and which can be known by our reason. We need to grieve and to mourn the loss of every in utero child including aborted ones, because each new creation is God’s own idea of His love, and has a place in creation and in history. Each and every creation has a role to play, a task to complete and has an influence to wield in a specific place, time, era. the creation of each new child God encounters and keeps encountering humanity. Hence why abortion is so horrendous. It is a rejection of this encounter with God and a rejection of His Love whispered in the depths of the silent, creative, mysterious womb. All created beings including the aborted ones have been thought about, loved and created in the likeness of the originating Word…….JESUS. which is written into the womb of every woman. It is this knowledge which leads to the mourning and in this mourning, the redeeming elements. spoken by abortion is “death” Moloch the prince of darkness speaks this word. I have called this talk A Redeeming Grief, because it is a great Mercy of God to be able to mourn deeply for an aborted child. And we know that there is mourning because in one way or another it is expressed. It can be expressed by the woman or man in a self violence, through drink, drugs, self abuse, depression, self neglect, self loathing. It can be expressed by the mental health compromising which occurs. It can be expressed by 3 the total denial that the procedure has caused a problem and the development of hardness of heart previously unknown. complicated type of mourning continues without the mercy of God. In fact it continues like a dull ache in the heart which has no ending. “I have written my laws on your heart” (Jer. 31:31-33) says the Lord. It is the place of profound encounter. The Heart is the place where God speaks and we cannot help but listen. It is the place where the pain of the aborted woman resides and without release from this pain her mental health is in danger. It is in this place of the heart where God needs to be invited when a woman is mourning her loss through abortion. It is the place where God visits and sees her sorrow over her decision and her need to be forgiven. Her grief is the clear expression of her regret. anyone who would listen both in Australia and countries around the world and I need to say that my understanding of abortion grief has changed. Abortion grief is perhaps the most profound type of grief in our day because of the intentional factor. And because it lends itself to a deep need for forgiveness both from God and infant, and then forgiveness of self and forgiveness of those surrounding the woman. systems which in turn affects not only her self but her significant others, her family, her friends, the health system and society. It is important to unmask this societal grief and then help her legitimately mourn for her deep loss and with the grace of God, recover. Never as before, but able to journey onwards. abortion, and I believe that this regret understood well can become the “forget –me-not” (Isaiah 49. 15-16) of their child. After thousands of counselling hours, with many tears shed it is possible to speak about the loss of the child and the profound grief through a different vision and with a different understanding. was very poignant “I regret that I never met my daughter and held her and bought her clothes, and took her to school and loved her and watched her become a “bride.” Then I reminded her that as long as she remembers her, she pays her daughter the love, respect honour due to her through her mourning and her memory of her. This child, her 4 aborted daughter whom she named “Rose” would live in her heart and mind and presence. This is good and necessary. experiences a great loss, especially where there is guilt, then regret may be the best and most merciful outcome possible. As I counsel and talk to men and women who have experienced abortion, they can see that regret is a memory tinged with both love and sorrow. It is a memory they wish to retain for as long as life exists. I thank God for that, in my own experience as well. To remember my son Joseph and my daughter Miriam, even with regret and sorrow is a rare privilege and not to be despised. To remember means that the infant/s that was meant not to exist is remembered. To no longer regret or remember means a certain forgetting must take place and this indeed would be a great tragedy. In conclusion the enormity of the grief and suffering which abortion inflicts cannot ever be truly reflected because society has placed a veil of unbelief before this horror. The veil of unreality (no it’s not a baby but a bunch of cells) preserves and protects society from the knowledge of what is being done and because of this veil of protection, abortion is sanitised, sterilised and removed from its true reality. However, post abortion syndrome, grief, and mourning, regret are the truth that abortion cannot be passed off as simply, or as a minor procedure. 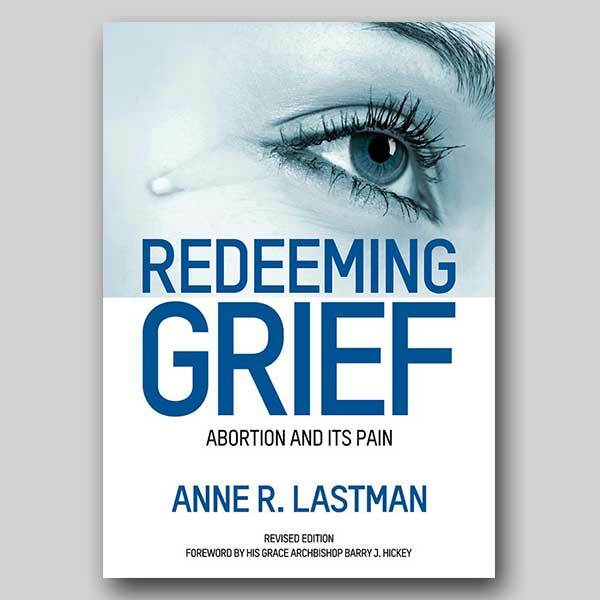 Abortion grief is real; pain filled and can be redemptive. It is neither useless suffering nor unnecessary, but it is indeed the most important suffering and mourning endured in our age. This type of regret, of grief and mourning brings before the eyes of the world the reality of what abortion really does and can re focus attention to the very thing that was destroyed. HUMAN LIFE AND ITS SANCTITY. This part of the conference has been called “Abortion an absence of Hope” Yet I believe that written within post abortion grief is the seed of hope which acts as the fuel to carry on the journey. In every journey there must be hope to reach a destination and the “hope” which fuels this journey is called “Mercy” or even “forgiveness” That God has loved us abortive women and forgives us and even our babies have forgiven us and one day we will meet and love together. The Holy Father Pope Benedict XVI in Spe Salve says “It is not science that redeems man. Man is redeemed by love” For the post abortive women their grief is the evidence of that love. The Holy Father further says “It is never too late to touch the heart of another. Nor is it in vain” I agree. To touch and heal the heart of a wounded post abortive mother is to heal her, those in her life and to help heal society. NO it’s not in vain but a NEW HOPE.